FairVote Canada has analyzed the results of our northern neighbor's recent Parliamentary election. Once again, Canada"s antiquated first-past-the-post system wasted millions of votes, distorted results, severely punished large blocks of voters, exaggerated regional differences, created an unrepresentative Parliament, and may possibly have even given us the wrong government. Canadians understand "government" a little differently. Where we tend to talk about everyone in Washington, they specifically mean the Prime Minister (PM) and Cabinet. And their government comes from their Parliament. The leader of the majority party (or coalition of parties, in this case) becomes PM, and (s)he chooses other Members of Parliament (MPs) to serve in Cabinet. But their elections work more or less the same way as ours. Every MP is elected in a single-member district (called a "riding"). The method is winner-take-all, so you can win with a minority of votes, just as long as you have more votes than any other individual candidate. In the prairies, Canada's equivalent of our Midwest, Conservatives won a number of seats vastly out of proportion with the number of votes they got. At the same time, 400,000 urban Conservatives in Canada's three biggest cities had the strength to elect nine MPs but elected none due to the district system. New Democrats, the rough equivalent of American Greens and liberal Dems, won almost a fifth of votes nationwide but got only a tenth of seats in return. The analysis also argues the election system's polarizing tendency exaggerated divisions based on locality (French vs. English, the West vs. Ottawa) at the expense of other differences of opinion meriting a voice in Parliament. 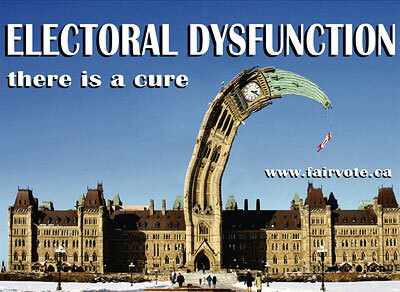 FairVote Canada has taken to calling it all "electoral dysfunction." And there is a cure.